October 7th marks the 10 year anniversary of the war in Afghanistan. And as if war has not been enough, famine is descending upon Afghans. As famine conditions have strengthened, funding for UN World Food Programme (WFP) has diminished. The UN food agency relies entirely on voluntary donations. WFP was forced to cut school meals for hundreds of thousands of Afghan children earlier this year. In a country deeply mired in poverty, school meals are a lifeline the children desperately need. Afghanistan has one of the highest rates of hunger and malnutrition in the entire world. If this crisis, which is often ignored by policymakers, were given more attention many of Afghanistan’s ills could be remedied. For food is the foundation of peace, education and literacy, and maybe most of all hope. Hope and Afghanistan are two words not often associated. There is talk of donor fatigue when it comes to Afghanistan and hunger relief in general, but this is nonsense. Food aid programs make up less than one tenth of one percent of the entire federal budget. Congress has proposed reducing funding for the Food for Peace and other hunger fighting programs. This is such a mistake when peace in Afghanistan and other parts of the world depend on fighting hunger. After World War II, when a CARE package center was opened in downtown Cincinnati, Ohio people flocked there to buy food for hungry people overseas. The first one to do so was a former World War I infantryman. The first World War saw immense human suffering from both warfare and the resulting famine, and this donor had compassion and first-hand understanding of their plight. Americans from that generation did not suffer from donor fatigue, and continued feeding the hungry during the war and afterwards. Following the Second World War millions more were saved, and Europe was rebuilt from the important foundation of food. Today, we cannot forget about Afghanistan nor let the people suffer. On this 10 year anniversary of the war in Afghanistan, let’s work to win the peace. It can start with fighting hunger. Article first published as Afghanistan 10 years later- Starvation Threatens War-Torn Country at Blogcritics. 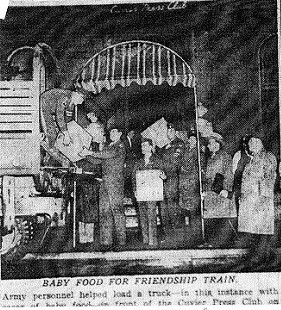 Baby Food for the Friendship Train in 1947. A group of Army personnel went on a special mission in downtown Cincinnati, Ohio in the fall of 1947. This group of soldiers was helping to load boxes of baby food onto a truck. The following day a train was to roll into Cincinnati to pick up the food. Its destination: Europe. World War II was over, but the peace was not yet won. Millions of people in the war-devastated countries were suffering from food shortages. Harsh winters and drought had followed the war. Reconstruction still had a way to go. Children were at severe risk of stunted growth if they could not get the right nutrients. Americans took action. The Friendship Train, as it was called, went from coast to coast picking up food like the baby formula. One of the great achievements in American history was helping to rebuild Europe after World War II, and the Friendship Train was part of this. The world scene now is no different, in the sense that food is needed to win the peace. If children are hungry, action has to be taken. What better way to do so than a Friendship Train of plumpy’nut heading toward the areas of suffering and conflict around the globe? Plumpy’nut is the special peanut paste that rescues children from life-threatening malnutrition. The key is to get plumpy’nut to every child at risk from malnutrition so they can be saved. Low funding and lack of political will are often what prevents this. While there are many great efforts ongoing among the public to raise funds and promote plumpy’nut, getting all the political leaders on board is essential. It has to be a team effort, as Josette Sheeran, the World Food Programme’s director, often points out. A Friendship Train of plumpy’nut today could rescue every malnourished child whether it’s in East Africa, Sudan, Democratic Republic of the Congo, Yemen, Afghanistan, Guatemala, or any of the other suffering countries. It’s critical to reach the children because without nutrition in the first thousand days of life, they suffer lasting physical and mental damage. It is unacceptable that low funding prevents foods like plumpy’nut from reaching malnourished children. Food aid is relatively inexpensive when it comes to foreign policy spending. Global hunger-fighting programs make up less than one-tenth of one percent of the entire U.S. federal budget. So let’s get the Friendship Train rolling. All aboard with plumpy’nut. Save lives and help an entire generation of children to be healthy and strong enough to overcome the challenges their country may face. Article first published as Friendship Trains, Global Hunger and Plumpy’nut on Blogcritics. News about Yemen is dominating the airwaves following the killing of the Al Qaeda leader there. Far less reported is the suffering of those displaced by the fighting between the government and Al Qaeda-linked militants. 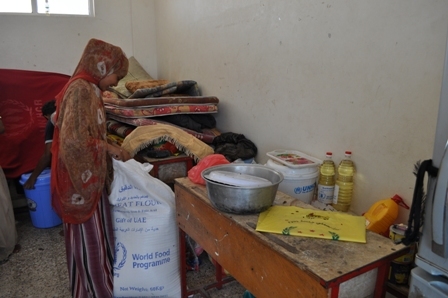 Abeer Etefa of the United Nations World Food Programme (WFP) just visited the southern port city of Aden and witnessed the terrible conditions in which displaced Yemenis are living. See the full article and video at Blogcritics Magazine. Afghanistan is on the verge of a huge humanitarian disaster. Drought has ruined food supplies, and three million Afghans will face starvation if aid agencies do not have the resources in time to respond. The lead agency in fighting hunger in Afghanistan, the UN World Food Programme (WFP), is low on funding. WFP, which relies on voluntary donations from governments and the public, is about $200 million short for this year’s Afghanistan mission. WFP will require additional funds to feed more people suffering from hunger because of the drought. For even before the recent drought took hold, Afghanistan was a country in a severe hunger crisis, with children suffering the most. The UN report summary highlights the startling numbers which show that “68% of the Afghan population is affected by some form of food insecurity with 31% food-insecure and 37% borderline food-insecure.” This means most Afghans struggle to get basic foods. Any shock like a spike in food prices, or disaster like drought, is devastating to Afghans who have little food. For children the situation is gravest. In Afghanistan 40% of children under five years of age are underweight with 54% stunting. Children are struggling to get nutrition when they need it most in those early years. Children suffer lasting physical and mental damage from malnutrition in the first thousand days of life. With such poor health among its children, Afghanistan’s future is virtually doomed. It’s important to keep in mind that with WFP facing such low funding, school feeding and food for work projects have already been reduced. There are almost 500,000 children who lost their school meal ration because of this shortage. So these safety nets are currently not available to many Afghans at a time when they need them more than ever. What Afghanistan needs now is a prompt intervention to save people from starvation in the coming months. What they also need are more long-term investments toward building the resiliency of communities facing drought. Afghanistan cannot build a peace while its population suffers from hunger and want. No society can. The U.S. Congress right now is debating how much to fund its Food for Peace and other global hunger fighting programs. They need look no further than Afghanistan to understand how critical food assistance is to nations in crisis. Article first published as Acting Now Can Save Afghans from Starvation on Blogcritics. Famine in Somalia. Is the Wolf at the Door in Afghanistan? Aid agencies are racing to save people from starvation in Somalia. UNICEF says that a child dies every 6 minutes in the famine-ravaged country. Severe drought in East Africa, coupled with the conflict in Somalia, has produced one of the worst humanitarian tragedies in decades. The United Nations World Food Programme has been facing low funding for its Afghan relief operation this year, so there was already a hunger crisis firmly in place before this drought took hold. WFP, at last report, was about $200 million short on funding for its 2011 operation. Earlier this year WFP had to cut school meals for about 500,000 Afghan children because of the low funding. For children in developing countries school meals are often the only meal they receive the entire day. Afghanistan is a country that needs a nationwide school meals program, not a reduction in child feeding. WFP programs to help small farmers are also impacted by low funding. It is expected that almost 3 million people will need food aid this fall in Afghanistan, on top of a population of 7 million already suffering from hunger. In a country seeking to build peace, will it now be confronted with famine? Afghanistan needs an emergency response now as well as plans to prevent future tragedies. This past week in New York Josette Sheeran, the UN World Food Programme’s director, urged actions to prevent famine from striking again. Where there are investments in food security, as well as open access, a powerful line of defense can be built against famine. The drought In East Africa is proof of this. These programs require enough funding from the international community. However, WFP has faced funding shortages for its operations all year, including in Somalia. The international community needs to act fast in Somalia and Afghanistan. In addition to meeting emergency needs, long-term solutions have to be put in place. We cannot afford another humanitarian disaster. Article first published as Famine in Somalia. Is the Wolf at the Door in Afghanistan? on Blogcritics. UNICEF reports there are “very high” malnutrition rates among children under 5 years of age in the Hajjah governorate of Yemen. These startling findings include the Haradh, Bakeel Al Meer and Mustaba districts. The malnutrition rates are “way above the emergency thresholds.” Some of the cases are the most severe type of malnutrition. Without the proper nutrients small children are threatened with lasting physical and mental damage. Many children in Yemen never recover after being attacked by malnutrition. Intervention is needed swiftly. UNICEF has continued to run its operations in Yemen even during the most recent escalation of violence in the capital of Sanaa. However, the agency faces a funding shortage and does not have the resources to reach all cases of malnutrition. UNICEF and the World Food Programme depend on voluntary funding from governments and the public. While there is increasing international focus on Yemen with its political struggles and Al Qaeda presence, this has not translated into support for child feeding and rehabilitation. Meanwhile, the presence of the U.S. military has escalated via drone planes as part of the fight against Al Qaeda in the Arabian Peninsula. Every day is a struggle for children to survive in Yemen. The crisis facing Yemen’s children extends to education where there is precious little of it. UNICEF is trying to help reverse this backward trend. Geert Cappelaere, the director of UNICEF Yemen says, “Without an educated population, no country thrives. In a country where only 70% of boys and 60% of girls receive basic education no effort should be spared in making sure every single child is sent to school this year.” UNICEF, USAID, CHF International and Save the Children are partnering with Yemen’s Ministry of Education on a Back to School Campaign. The idea is to increase the enrollment of Yemeni children in school and reduce the dropout rate. Both of these tasks are huge challenges in this impoverished country facing political upheaval. The campaign features stressing the importance of education, the distribution of school supplies as well as teacher training. One tool in increasing school attendance though is missing. This would be the UN World Food Programme’s (WFP) school feeding initiative to provide take-home rations. Low funding for WFP forced suspension of the program in 2010. Since 2008, high food prices and low funding from the international community have devastated the WFP Food for Education in Yemen. Should this program be restarted and expanded nationwide, it would have a positive impact on increasing school attendance and lowering malnutrition rates. Dr. Rajia Sharhan of UNICEF points out that school feeding would have the effect of improving the health of future mothers. Yemen needs to be developing a national school lunch program. But Yemen faces so many hurdles before they can start attacking these problems. The political turmoil and violence has to come to an end. The international community has to support the work of UNICEF, WFP and other aid agencies. Article first published as Without Nutrition and Education Yemen Cannot Thrive on Blogcritics.